#1 Most important! check to be sure your service provider is certified and licensed. BEST PORTABLES is your qualified vendor! It is required by Federal Law that a vendor providing septic services be certified and bonded. A license is required by the state in which they operate, as well as local inspections and permits required annually by the Health Department. Make sure you are using a bonded, certified, and licensed service provider for your project or event. Our Units and Service Equipment are safe first, durable, clean and well maintained. How many portable toilets do I need for my construction project? The American National Standards Institute states that all construction sites must have at least 1 portable toilet per every 10 workers during an 8-10 hour workday. It is recommended that the unit be serviced and pumped weekly or bi-weekly. On average, you’ll want to have at least one unit available for every 75 people you expect. 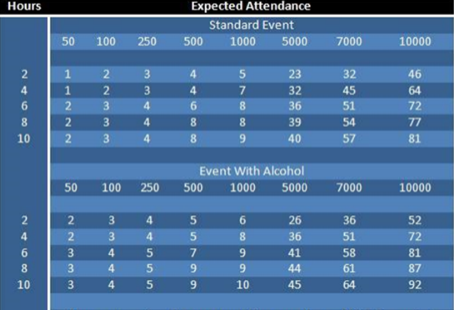 The duration of the event will also play a factor in determining the number of units you will require. We also recommend increasing your number of rentals by 20% if alcohol is being served. How many uses before the holding tank is full? Typically, portable toilets contain a 50-60 gallon holding tank and will fill up after 90-100 uses. If the standard recommendations are followed, the toilets will likely fill to capacity in 6 hours with steady use. Standard holding tanks or bladders will hold 200-250 gallons of waste. Under section 4.1.2(6) of the Americans with Disabilities Act Accessibility Guidelines (ADAAG), at least five percent of single user portable toilets clustered at a single location must be handicap-accessible. – This does not apply to construction job sites. A portable toilet uses 90% less water than a conventional toilet. The first toilet cubicle is usually used least. This makes it the cleanest toilet in a row. The U.S. spent over $100,000 on a survey to determine whether it was more common to put the toilet paper in the holder with the flap facing the front or behind. The flap in the front is the most popular. The Chinese are credited with inventing toilet paper in 1391 during the reign of the Hongwu emperor. Each sheet measured 2 feet by 3 feet, indicating that His Highness must have greatly valued a clean rump. The average number of sheets of toilet paper used per use is 8. The word Toilet came to be used in English along with other French fashions. The term, Lavatory, was originally used to refer to a vessel for washing. The Loo, a chiefly British term used for the restroom, and origin is unknown. The Dunny is an Australian expression for an outdoor toilet or outhouse. The Netty is the most common word used in northeastern England. And, the Latrine, a term commonly used in the military. The Jacks is Irish slang for toilet. 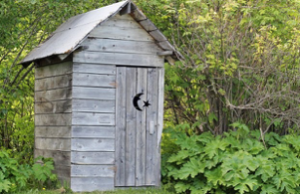 The Outhouse was a common term used in early America. How Many Toilets Will I Need?